The rankings are calculated by adding together the points (i.e. 3 for a win, 2 for second place, 1 for third place and 0 for fourth place) won by each team representing a college or university over the previous five competitive Worlds for that institution. Bates competitors accumulated a total of 223 points while competing at World Championships in Dublin, Ireland (2006), Kuala Lumpur, Malaysia (2005), Singapore (2004), Stellenbosch, South Africa (2003) and Toronto, Canada (2002). “We are the third domestic team ranked on the world’s debate platform, upstaged only by LaVerne University [in 14th place with 232 points] and Yale [in 11th place with 260 points],” says Vaibhav Bajpai ’07 of Calcutta, India, publicity director for the Brooks Quimby Debate Council. Oxford and Cambridge universities top the international list with 483 and 482 points respectively. Bates debaters have completed a fall season with impressive standings. The team of Brendan Jarboe ’08 of Acton, Mass., and Bajpai ranks as 14th on the domestic intervarsity debate circuit. Alix Melamed ’10 of New York, N.Y., is eighth best novice speaker in the nation, and Michael Neville-O’Neill ’07 of Rowley, Mass., is currently ranked as the nation’s 48th best speaker. This fall, Bates debaters have traveled abroad to tournaments at Cambridge, accompanied by Andrea Curtis, the new assistant director of debate at Bates, and to Oxford, Newcastle and Durham, United Kingdom, accompanied by coach and director of debate Bryan Brito. The teams of Ryan Creighton ’07 of Lyme, N.H., and Neville-O’Neill, and Jarboe and Louis Dennig ’07 of Woodland Hills, Calif., debated at Cambridge. Rachel Pool ’07 of Mountain View, Ark., and Dylan Morris ’07 of Bloomington, Minn., along with Arianne Mandell ’09 of Amherst, N.H., and Tamara Wyche ’08 of Baltimore, Md., competed at Oxford. Mike Smilowitz ’08 of Brooklyn, N.Y., and Nathan Place ’09 of New York, N.Y., and Geoff Shaughnessy ’09 of Hanover, N.H., and Joe Drury’ 09 of Kalsipell, Mont., debated at Newcastle and Durham. Bates follows its strong autumn showing with a trip to this year’s Worlds in Vancouver from Dec. 27 through Jan. 4. Bates will send teams composed of Creighton and Neville-O’Neill and Jarboe and Bajpai, as well as Denning and Casey Pfitzner ‘ 07 of Spotsylvania, Va.; and Matt Robinson ’07 of Washington, D.C., and Dan Berman ‘ 08 of Winchester, Mass. Brito, Curtis, Shaughnessy and Drury will accompany the debaters as judges. “We are sending some nationally ranked debate teams to the Worlds this year with the hope that we can climb even higher in the rankings,” says Bajpai. He attributes the team’s ascent in world and domestic rankings to the college’s consistent commitment to the tradition of debate and civil discourse. Meanwhile, closer to home, Bates debaters Neville-O’Neill and Creighton traveled to Colby College in November for what the two schools hope will be the first of a series of debates. The topic, “Foreign combatants captured and detained by the U.S. government in the ‘war on terror’ are entitled to all legal protections offered in international POW treaties,” made for a hotly contested discussion. “We won the audience’s vote by an overwhelming majority,” Bajpai says. The Brooks Quimby Debate Council hosts the North American Debating Championships Jan. 26-28, 2007, at Bates College. 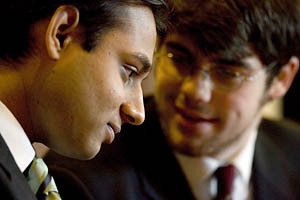 Known as “NorAms,” the competition is the top debating championship in North America, held on an alternating basis in the United States and Canada since 1991.